Sadly, Colin Lanceley died early this morning. Colin was, of course, one of Australia’s most prominent senior artists. He first made an impact as a member of the riotous and radical Annandale Imitation Realists in the early 1960s and two works by him from this period can be seen in the first section of Pop to popism – the collaborative Byzantium 1961-62 and his Love me stripper 1963 , which was first owned by critic Robert Hughes. Getting to know Colin a little better was one of the great pleasures of working on the Pop exhibition. Colin won the Helena Rubinstein Travelling Scholarship in 1964 and subsequently travelled extensively in Europe before settling in London, where he established a high profile international career. Colin and his wife Kay returned to Sydney in 1981 and became central figures in the Sydney art scene. 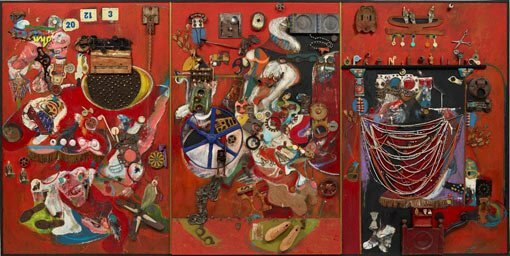 The Art Gallery of NSW has a fine collection of Colin’s work and his major mixed-media painting The Dry Salvages 1963-64 will be included in the Australian collection rehang when the 20th- and 21st-century galleries reopen in April.